I have a question on reception and anti-reception (maybe I'll call it rejection). Assume Venus in Cancer is applying trine to Jupiter in Scorpio. Jupiter receives Venus by exaltation and Venus "rejects" Jupiter by detriment - according to traditional astrologers. However, Venus exalts Jupiter because Venus is in the sign where Jupiter is exalted - according to John Frawley. How is it that Venus who exalts Jupiter rejects him? The short answer to your question is that the question you've asked mixes two different systems: the traditional approach, and John Frawley's method. The question comes up periodically so there are a few threads on this forum about it that will come up in the 'search' facility but unfortunately John Frawley's horary textbook doesn't mention the origins of his system and why he deviates from the traditional approach so we're none the wiser. Maybe he explains it somewhere else, but if so I haven't been able to find it yet. 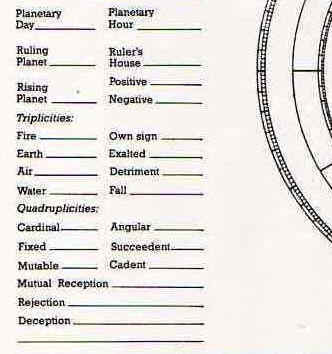 Besides reception, you must consider the nature of the planets and house placements and the aspect itself. Both Venus and Jupiter are benefics, and, depending on other factors (house placements, rulerships, etc. ), their influence would probably be gentler than say a Mars-Saturn connection. Venus brings the trine aspect to Jupiter most likely because she is generally the faster planet (unless she is slow in the chart), which shows some interest and there is generally no dislike in a trine aspect, but the poor reception poses problems in that aspect. I would interpret it as Venus bringing something to Jupiter that Jupiter likes (receives into his exaltation of Cancer) but that Venus thinks she likes but it ends up not being to her standards (does not receive into her detriment), so she may deny it, etc. It is also different than say Venus being in detriment or fall herself because she cannot receive ANY planet when she is in detriment or fall because she is too debilitated. So essential dignity/debility is important too. Ideally, you'd want two essentially (and accidentally) dignified planets applying favorably and receiving one another for the aspect to be at its best. Here Venus does not have strong essential dignity (the most she can have is face or term) and can receive another just not Jupiter here. Jupiter also only has term at best, though he can receive another too. I would say that the trine is at least a bit weaker because there is an outcome that is not up to Venus' standards and the two planets don't have (much at best) essential dignity. Accidental debility obviously can change things too. How can a combust planet do much good in an aspect, since it is so overpowered and weak? If Jupiter were combust, how well might he receive Venus even though she's in his exaltation? What if he were retro or stationary? All of these things might be considerations. Most traditionalists would not agree with Frawley, and I know I personally find his reception to be unreliable - in my own readings for myself and in my readings for others. I've even asked people I've given readings to which way made sense to them in the interpretation, and Frawley always lost. I know there are followers of Frawley who find him to be useful, but he mostly just confuses horary students. It took many months for me to unlearn his methods. I also find the same thing to be true in natal - Frawley's methods don't work. The best way to test it is to try it on your own chart. For myself, I always look to my Venus-Mars relationship. My Venus is in Aries (detriment) conjunct Mars in Aries (domicile). Frawley would say that Venus loves Mars because she is in his domicile and Mars hates Venus because he is in her detriment, but the opposite is true and that doesn't make a lick of sense because why would Mars hate a planet in his own place where he is happy? Oops, lest I was a bit horary-centric there, I'll add that besides his horary textbook I've also read John Frawley's The Real Astrology book and didn't find anything about the origins or rationale of his method there either. Thank you to both of you (Tanit and handn)! So, all other things being equal, when A is in B's domicile or exaltation (and they are in aspect) it is not A that loves B because A is in B's domicile/exaltation (as Frawley would have said in his books and magazines) but B that receives A (according to the traditional astrologers) - hence it is B that likes/loves A. Am I correct? One other thing. When A is in B's domicile, B is also dispositor of A which means that B has "power" over A. In this case, does B show more power (because of dispositorship) or love (because of reception). I understand that reception requires aspect - does the having power over a planet by dispositorship also requires aspect (which then mean that reception is exactly identical to reception)? All things being equal, that's right. You would say A planet receives B planet when B is in a sign of A's domicile, exal, trip, or two lesser dignities. The way I think about it is that planet A wants to be where planet B is because that's an area of the zodiac where it has essential strength. If you study hyleg/alcoccodens it starts to make more sense too because an alcoccoden has to be the planet with the most strength in the place of a hyleg and aspect it (the alcoccoden receives the hyleg). Robert Hand has a useful workshop on YouTube that you can watch called, "Reception." Normally you'd want reception to be both ways, in traditional, for it to lead to much, but one-way can be descriptive. AND, again, remember the condition of the planet that is trying to recieve another. Say you have a chart where Venus and Mars are the querent/quesited and Venus is in Scorpio and Mars is in Taurus in a square aspect. Squares are of course difficult already, but each planet is in the sign of their own detriment while the each are in eachothers' domicile. So does Mars receive and love Venus and Venus receive and love Mars because they are mutually in each other's domicile? They try to receive/love but can't properly because they are in detriment themselves and a square is a conflictual relationship. There is never an easy answer to such questions because it depends on factors that lead to a whole. I think I've heard the dispositor described as a "host" the most, though some have called it a "landlord". The dispositor (host) has a vested interest in making its guest happy and try not to hurt it. Reception is part of this obviously because the host receives its guest, so it cares for it, watches out for its interests, or loves it, etc. If there is a proper aspect, that is more significant because the host can "see" the guest. If the host is a crazy malefic, it can be a good thing when it is unable to cause harm to you, but nobody wants a crazy host because you are somehow connected to them - the landlord concept makes this easier to envision. Landlords usually do hold power, right? In "The Reception Debate" link I posted, Deborah talks about a Sun in Libra - Mars in Leo aspect, a sextile, and she mentions that Mars feels overwhelmed by the Sun because he is Mars' dispositor and does have control over him, but this is also because the Sun brings a sextile aspect to Mars, which is also the place of Mars' detriment in Libra. So, yes, the dispositor (or host) can hold power, but if there is an applying aspect by the host this is more so. As in her example, the dispositor can sometimes cause harm to the planet that is its guest, even when it doesn't intentionally want to. The "love" nature would have to be analysed by the reception, aspect and dignity of the planets in concert because each one would give a clue about the whole. Since Sun in Libra is in fall, he is unable to receive Mars even though Mars is in Sun's domicile of Leo, and Sun is also afflictive because, again, Sun is bad off and also brings Mars to a place where he is weakest in Libra. They both likely care about one another because of the sextile alone and also because Mars is in Sun's domicile, but caring for each other and being a good influence are two different things. You normally don't hurt people when you truly love them, although it can be unintentional. In the "Reception" conference, Hand talks about a "pushing dignity" concept too, which is when an essentially debilitated planet can receive strength from its dispositor if the dispositor has essential strength itself and aspects it. So the host is a source of strength for its guest. John Frawley's horary textbook doesn't mention the origins of his system and why he deviates from the traditional approach so we're none the wiser. I have only learned his methods second-hand, but I am guessing it has something to do with when a planet is in the house of another? Say you have an ASC with Libra rising and Aries setting and querent is Venus in Aries in the 7th house. Lilly would say that the querent (Venus) is fond of the quesited (Mars) because she is in his house (the 7th is his 1st house), as Frawley would say that Venus in Aries (whether in the 7th or not) loves Mars also. But Lilly sticks with traditional reception otherwise, it has to do with being in the other's house, and thus having them on your mind, just as when a planet is in its own house and sign it doesn't think of the querent/questited but thinks of itself - say Venus was in Libra in the 1st instead, then she doesn't think much of the quesited. It may go further back than Lilly, but I always remember that quote. Frawley is probably improvising on this. In a way, this house thing is confusing because a detrimented significator doesn't seem like a good influence or capable of a good love relationship because it is too debilitated to do much, but I guess it's true that love can make people weak too. The more "ponderous," or slower planet, is supposedly not the "master" in a relationship either, via Lilly. The applying, swifter planet is the master, though we also usually say they are the fonder because they make the relationship happen. Thank you Tanit for that comprehensive reply. Must have taken a lot of time to think type the responses. Thanx again! Write a dissertation on a subject so far omitted from the Course, but which you consider every horary astrologer should read. In the future it can be circulated with this session. So that is where Frawley got it from - it was my work. I still have the papers sent Olivia and she refered to my studies on the subject in her book on Horary Astrology. You will find some of my comments on the rejection & deception at the bottom of this link. Sorry to say this Andrew but to me it doesn't matter where it comes from -all this incorrect information about what reception is, who receives who, and the prospect of being able to receive in a place of debility - it's not a 'method', just a mistake. Or a misunderstanding. My version is that planets do not receive by detriment or fall, and that this condition may be a prohibition. People seems to be asking about Frawley's source, which he did not provide. I was the author. Anyhow, no more than that. Maybe I'm misunderstanding (and please correct me if I am) but I think you're talking about where John Frawley got the ideas about rejection and deception? If so, that's not what the Frawley attribution at the start of the thread was referring to. What we were meaning is where did Frawley get the idea from that reception works in the reverse direction to that which is described throughout the tradition of astrology. From what I've read of your site you don't have it in reverse like John Frawley does. About the issue of 'does it matter where it comes from'.... who originated it doesn't matter, I'd agree with that (as long as they're not passing something off as their own when credit belongs to someone else). But it matters very much to a lot of people that John Frawley says he is teaching the traditional method of reception when he must know by now that he isn't. It causes a lot of unnecessary problems and it's costly in a few respects. I suspect its got to the point where John Frawley couldn't really backtrack on this issue at this point without major embarrasment. Its not a trivial issue. Its been fundamental to the delineation style he has taught others for years. Moreover, this issue has gone well beyond being a personal issue about John Frawley. There is now a large crop of former students of John Frawley who are teaching this too. Some of them are quite prominent in their own right. So its not just an issue about students new to traditional astrology getting confused. Maybe, the better read, more erudite traditional astrologers are just too polite and subtle to openly challenge other professionals. In fairness, the astrological community is not that big and the traditional astrological world still smaller. Telling other astrologers they have 'got it wrong' on a key area like this is obviously not something to undertake lightly. One thing seems clear to me. Venting our spleens here will change nothing. Venting our spleens here will change nothing. Ficina will be transporting us off the pitch in her wheel-barrow. No, it shouldn't have to come to that. I don't mind discussing my thoughts and observations on the topic of rejections and deceptions as I applied and probably introduced the terms in 1985-86. At this time I was registering combinations in every chart I cast and had a new chart form laid out and printed to fascilitate for my needs. Of course, if the matter being discussed is actually something else, then I don't need to get involved.